Fact: I love themed polishes. There’s something about a great themed collection that makes it totally irresistible for me. On top of that, I adore the old-timey holidays- so Doctor Lacquer’s adorable JingleX3 collection (inspired by the Rankin-Bass stopmotion Christmas movies) called my name in a serious way. The whole collection is just the perfect adorable, glittery expression of the spirit of those movies. So today I have “Pull Up An Ice Block,” one of my sale-induces impulse purchases from this collection- and my first Doctor Lacquer ever! “Pull Up An Ice Block” is a white crelly with green/lime metallic glitters inspired by Sam the Snowman from Rudolph the Red-Nosed Reindeer (circa 1964). 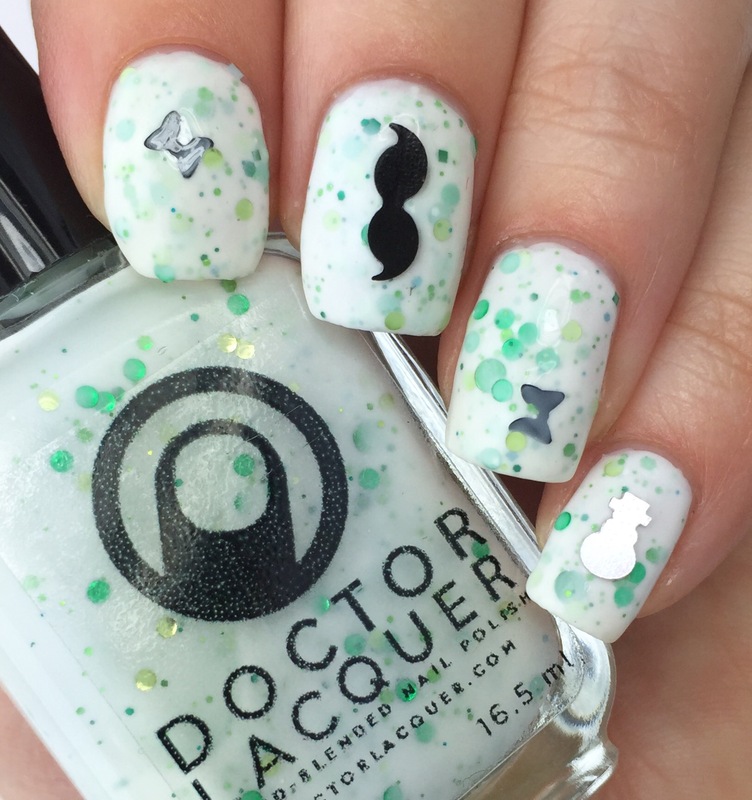 In addition to the green glitters, this polish has black bowties and mustaches and comes with a bag of mustaches and holo snowmen glitters so you can place them at will. I really love when brands include tiny bags of loose glitter with a polish- it means you never have to go fishing of do any brush-gymnastics to get the look you’re going for. I can sometimes struggle to play nice with crellies, but I absolutely adore how this looks. 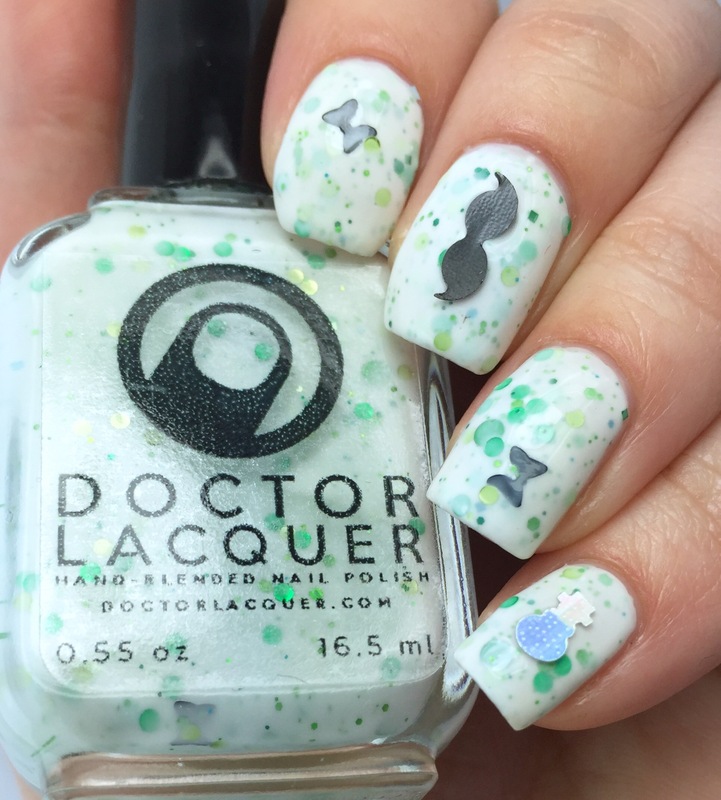 The chunky glitter floating in white is the perfect reference to the source material (round glitters = round snowman; white crelly layers = foggy snow)! For me, I found wear time on this to be slightly on the lower side. I wore it with the extra glitters, and dang- that mustache got caught on everything. Also, I must be a disgusting person who white nail polish can never stay pristine. The crelly takes 2-3 layers for full opacity, and with the layers of topcoat I wore to take the glitters, it was a bit on the thicker side. Still, the chunky glitter kept it from chipping, which is an added bonus. The great news is that “Pull Up An Ice Block” and all of its collection-brethren are still available on Doctor Lacquer’s site! I have to say that the purchasing and shipping experience for me was great. I bought during a mad sale in November and got shipping notification right away- and then got my polishes across the country in less than a week. The customer service has been top notch as well. I showed by mom these polishes for Christmas and she placed an order during Black Friday/Cyber Monday festivities. Doctor Lacquer actually got in touch with my mom, let her know that she forgot the sale code, and then adjusted the price. My mom didn’t even know there was a sale she was missing out on. I was really, genuinely impressed- they didn’t have t do that, but it is something that will make me a happy/loyal customer. So what do you think? Are you a fan of white crellies? Do you have a favorite Christmas/holiday movie? So cute! 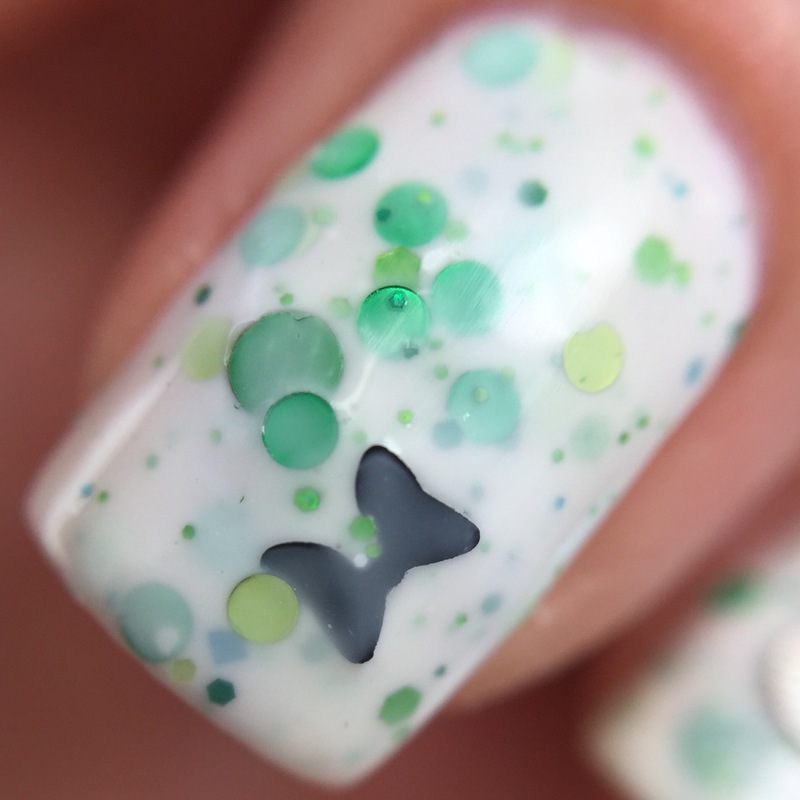 This is definitely one of the more unique polishes I’ve seen. the shapes in this are so cute! 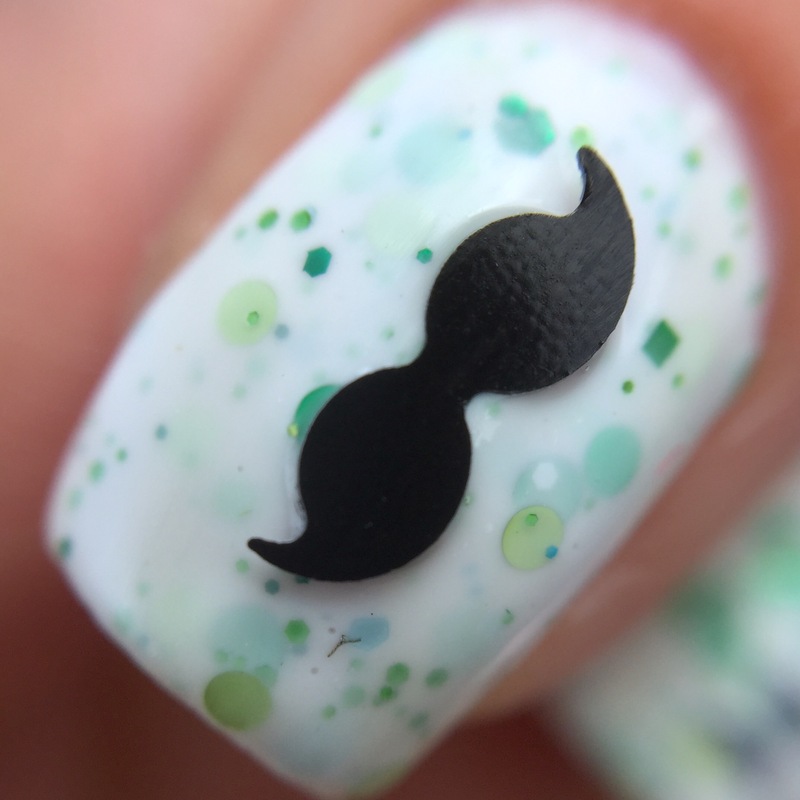 I couldn’t resist the mustaches- it’s not a glitter shape I’ve seen before. Hah I loved that movie! I love that she includes extra glitter for you to place but boo on it getting caught on everything. Very nice review! I haven’t bought a lot of indies so the extra bag of glitters is new to me and such an adorable idea. 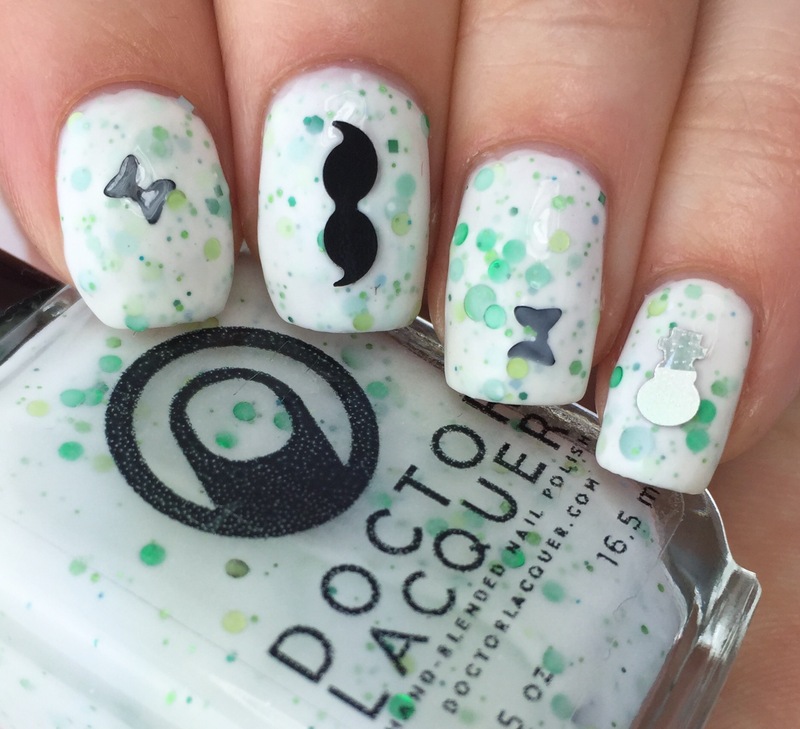 I wear a polish for a week so I’d add something like the mustache or snowman on the second to last day so I wouldn’t pull it off. That’s such a good idea! I always putting the extra glitter on first and then have to resist picking at it because I can’t deal with anything not totally smooth. The extra glitter is also great for saving and using later in totally unrelated nail art! I adore that crelly, and the moustache is so cute! Also love the snowman glitter. That’s amazing that they actually got in touch with your Mum to tell her she forgot the sale code! Best customer care in the history of customer care! Lovely swatch! I love this take on a holiday/wintery polish!